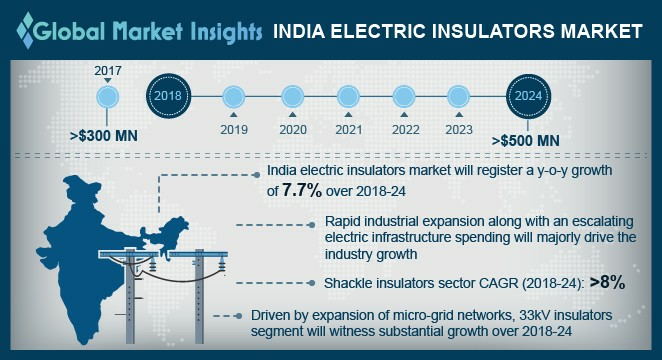 India Electric Insulators Market size will exceed USD 500 Million by 2024, as reported in the latest study by Global Market Insights, Inc. Growing investment toward the modernization of existing grid networks coupled with favorable regulatory inclination for the establishment of sustainable T&D infrastructure will boost the electric insulators market growth. Initiatives taken by regulatory authorities for the implementation of smart grid projects will further fuel the industry landscape. For instance, the National Smart Grid Mission launched by the Government of India in 2015, charts out a deployment schedule for 20 years for establishing an integrated inter-state, inter-regional, and intra-state transmission network. Ability to provide reliable performance in rugged environments along with corrosion resistant properties and minimal leakage problems will drive the porcelain electric insulators market. Enhanced application of these insulators in transmission lines for safe transportation of energy and power supply will further accelerate the product adoption. Increasing efforts to provide reliable electricity to rural areas along with government measures toward grid expansion will stimulate the India electric insulators market growth. The Government of India in 2014 undertook the “Power for All” initiative with an aim to provide 24x7 power to all industrial, commercial and household entities by FY 2019. Government measures to further strengthen sub transmission and distribution networks will boost the business outlook. Low-voltage electric insulators market growth is facilitated by their widespread application in primary and secondary distribution channels. Ability to provide greater stability with high electrical resistance to leakage current along with favorable initiatives toward the expansion of distribution networks will further propel the product adoption. Legislative measures to meet the surging electricity demand coupled with shifting trend toward the expansion of overhead electric lines will enhance the India electric insulators market. Enhanced inclination to curb the transmission and distribution losses along with efforts to improve the access to modern energy will further stimulate the industry outlook. For instance, in 2016, the government of India launched the “One Nation, One Grid, One Price” program to remove the obstacles in the energy supply by interlinking all national & state grids to achieve a single-tariff structure throughout the country. Pin electric insulators market is set to witness robust growth on account of its extensive applicability in overhead lines for voltages up to 33 kV. Installation of pin insulators in low cost distribution lines in the form of single and multipiece construction to make power lines less vulnerable to damages will further stimulate the industry growth. Rising demand to establish an efficient network of transport infrastructure coupled with significant investments pouring in for the development of optimized and well-enhanced grid networks will drive the railways electric insulators market. In addition, the development of lightweight, high-strength, and vandal-resistant products to ensure barrier-free railway signals will further enhance the industry growth. Eminent industry players in the India electric insulators market include Aditya Birla Nuvo Ltd., Deccan Enterprises, Olectra Greentech, TE Connectivity, BHEL, Lapp Insulators and ABB amongst others.